A must have when using crimp beads to hide the crimp bead or tube and give your work a professional finished look. 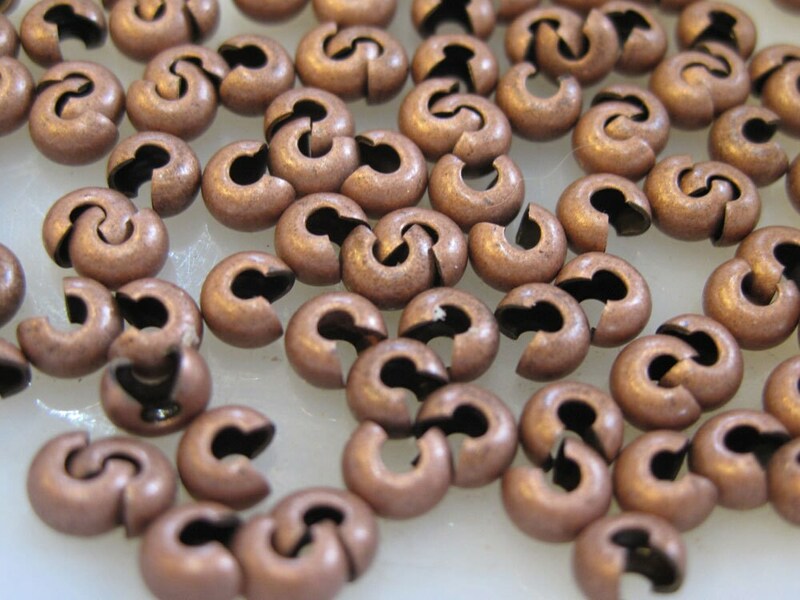 These are antique copper plated crimps and measure 4mm. Perfect size for the most common used 2x2mm crimp tubes. You will receive 20 crimp covers. If you are confused about what size of crimp cover to use join the club! So many sizes! Here's a good rule of thumb - the 3mm size works best over small crimp beads and tubes including 2x2mm. The 4mm is best to use for covering crimps 2x2mm and larger. Excellent quality and service. I would purchase here again. Nice antiqued copper finish. SUPER FAST delivery. Well packaged. I have done business with this seller in the past and will continue to do so. Nice copper covers, as described and fast shipping.